Blue is the official colour of the Collège Sainte-Anne de Lachine. The stripe represents the Lachine Canal, which runs alongside the college. The fleur-de-lis represents the location of the college in Quebec. The two keys symbolize the acquisition of the Simpson Manor by the Sisters of Saint Anne on May 1, 1861, as well as the ceremony at which the Sisters were presented the key to the main door. The keys also represent the institution as a guardian of knowledge passed down for generations from teachers to students. Education is the key to success, as demonstrated by the success of the college’s graduates. The college’s newspaper is also called La Clé [the key]. The crest depicts the dome of the main building of the Collège Sainte-Anne de Lachine, completed in 1889. This dome is one of the architectural jewels of Quebec. The cross at the summit symbolizes the Sisters of Saint Anne, the original proprietors of the college. The open book represents the college’s educational mission. The supporters represent the Centre d’activités du Collège Sainte-Anne, the mascot of which is a dragon. The lanterns symbolize the Lachine lighthouse. A symbol of light and an indispensable tool for guides, they represent the path to success and the role of teachers. The comportment represents the authorization that the Sisters of Saint Anne received to use stones from the Lachine Canal to expand the college. 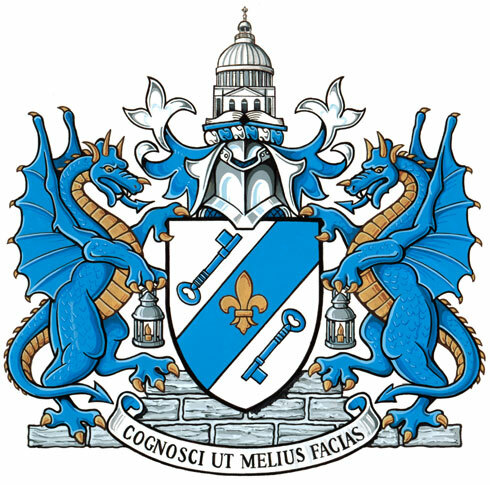 COGNOSCI UT MELIUS FACIAS, meaning “To know so as to better do”, has been the motto of the Collège Sainte-Anne de Lachine for many years.